Doncaster Rovers boss Grant McCann made no attempt to sugar-coat his team’s ‘chalk and cheese’ performance in their 2-1 defeat at Coventry City. McCann was pleased with his side’s second half display, in which Joe Wright netted and John Marquis came agonisingly close to a last gasp equaliser. 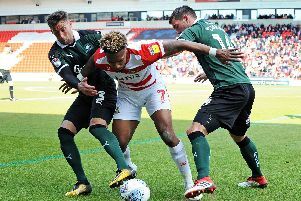 But the damage was done in the first half when a lethargic Rovers fell behind to goals from Jordy Hiwula and Luke Thomas – and McCann labelled it ‘not good enough’. “I thought in the first half we were poor,” said McCann. “I’ll never hide away from telling you what I think. “We weren’t good enough, as simple as that. “We conceded two sloppy goals. They’ll probably think the second one was a good one but it was poor from us. “The second half was different. It was almost like chalk and cheese really. “We had wave after wave, we just couldn’t find the goal. We get the goal and we have chances again to get something out of it. “But when you start games like that and give teams a two-goal start it’s difficult. Rovers have dropped to eighth in League One after collecting four points from the last possible 18.